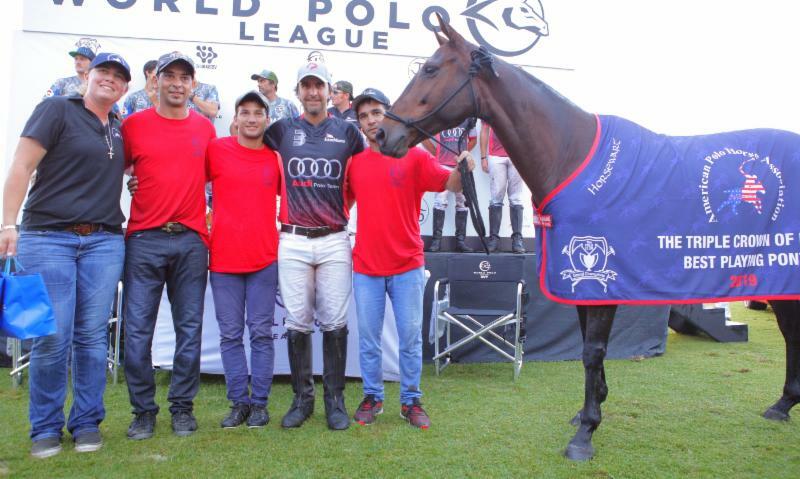 Triple Crown of Polo champion Colorado players Rob Jornayvaz, Juan Martin Zubia, Jero del Carril and Adolfo Cambiaso with WPL co-founder Bob Jornayvaz of J5 Equestrian. After two rain delays in the two hour, 20-minute season finale, Colorado joins Valiente, Grand Champions and SD Farms among the inaugural 26-goal league's tournament champions. 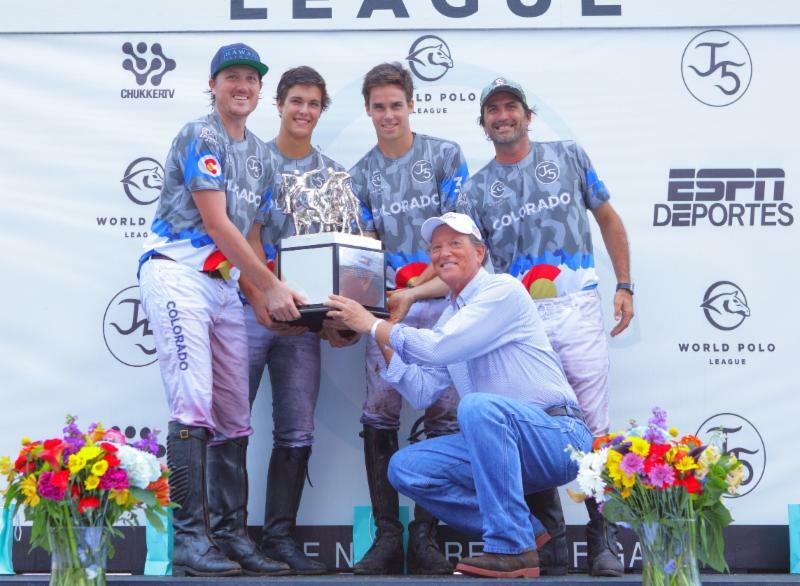 Colorado (Rob Jornayvaz, 2, Juan Martin Zubia, 7, Jero Del Carril, 7, Adolfo Cambiaso, 10) finished the eight-team tournament undefeated at 5-0 and won $90,000 in prize money. Kris Kampsen of Audi defends Jero del Carril of Colorado. Audi (Marc Ganzi, 2, Nic Roldan, 8, Pablo MacDonough, 10, Kris Kampsen, 6) dropped to 4-1. Both teams were making their second tournament final appearance. 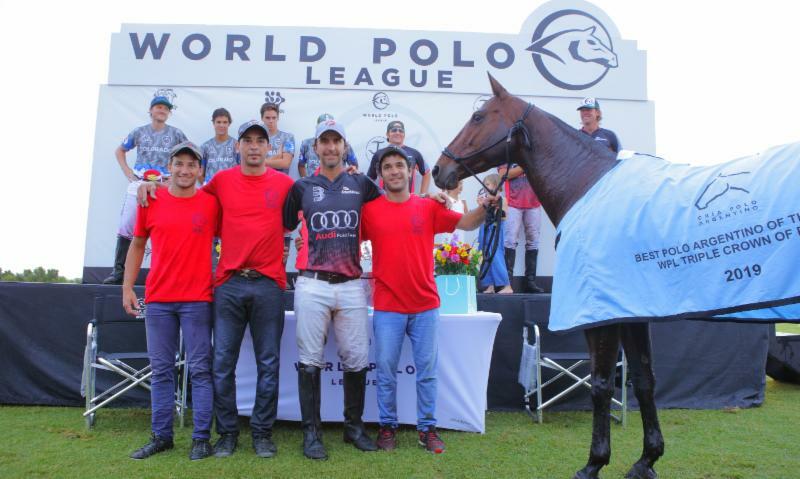 Cambiaso, a field general for his three young teammates including 19-year-old Zubia, was the game and tournament Most Valuable Player. His horse, Gaita, was Grand Champions Best Playing Pony. Ganzi was awarded the Catena Play of the Day. "This was a great way to end the season," Cambiaso said. "It's always nice to win. I think we deserved to win." Rob Jornayvaz of Colorado drives downfield with Nic Roldan of Audi defending. The start of the game was delayed 40 minutes and again with 3:51 left in the game because of heavy rain. "It was a super tough game," Jornayvaz said. "We weren't sure at the beginning if we were even going to be able to play. It was a battle from the beginning. It's always awesome to have Adolfo on your team because he is always good in those clutch moments." Pablo MacDonough of Audi works the ball in the air with Jero del Carril of Colorado defending. With Colorado leading 9-3 at the start of the fifth chukker, Audi caught on fire, found its system and controlled the momentum in the rain. 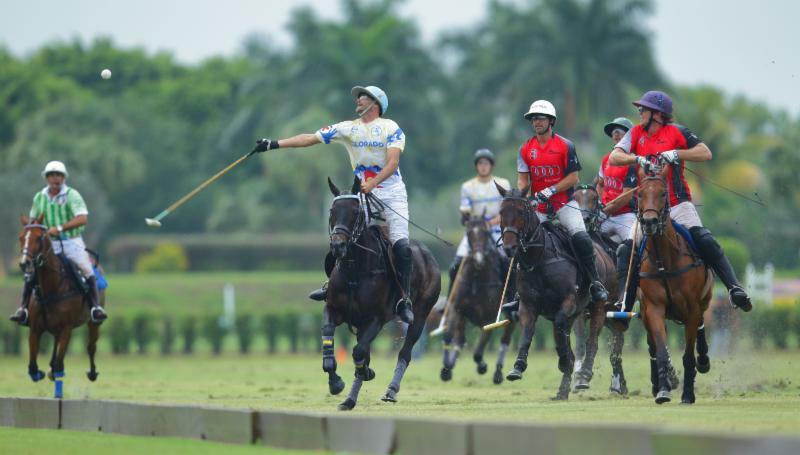 Audi rallied to score five unanswered goals in the fifth and sixth chukkers but came up short. 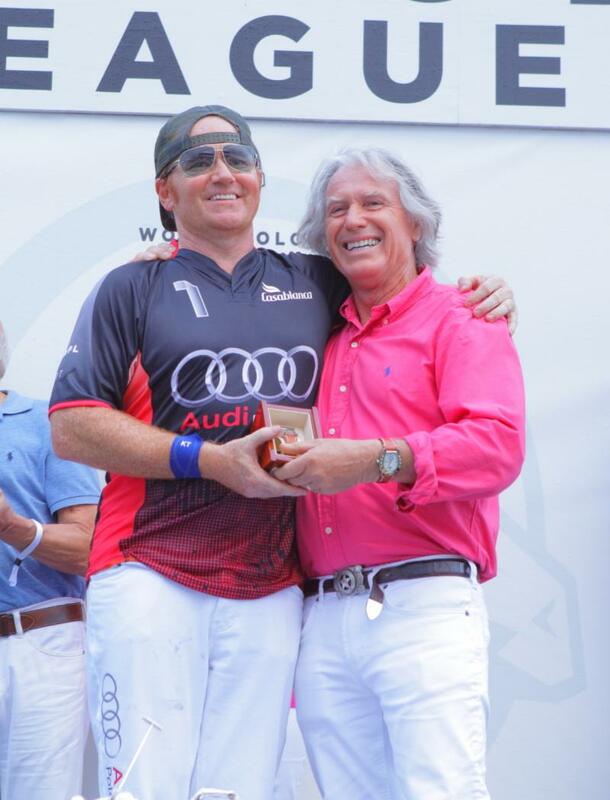 "We thought it was all over," said World Polo League guest commentator Pelon Stirling after Audi's remarkable comeback. 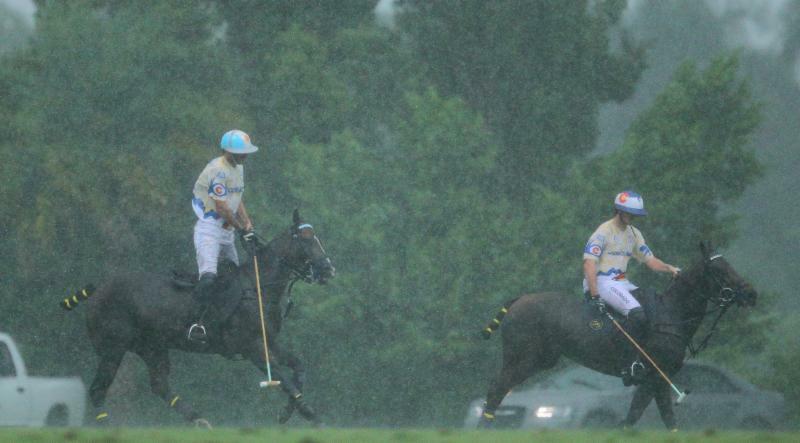 Colorado teammates Adolfo Cambiaso and Rob Jornayvaz head back to the player's tent for rain delay in final chukker. "You want drama, you got it," added play-by-play announcer Gus Whitelaw. "To ask for better polo than this would be greedy. The crowd is sticking around for this one, rain and all." Heavy rain forced another delay at 3:51. Juan Olivera of Grand Champions, Robertito Zedda of Valiente and WCT Commissioner Dale Smicklas walked the entire field to make sure it was still playable and safe. The field held up well thanks to the tireless work of the Grand Champions field crew throughout the season. 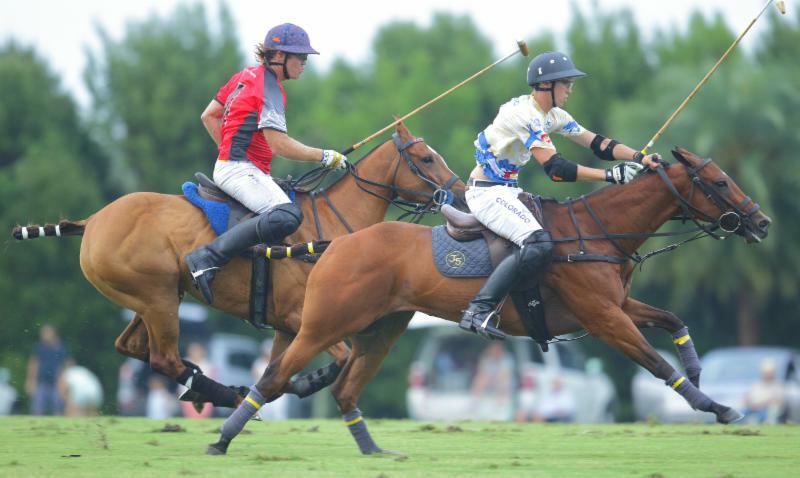 Nic Roldan of Audi works the near side shot with Adolfo Cambiaso of Colorado defending. "I think most of all it was a matter of safety," Jornayvaz said. "The thing that surprised us the most was how the field held up. It took a lot of water. I think we got a couple of inches in a few hours. When you have that amount of water on a field you always have to be concerned with safety first and luckily we were able to finish." The rain let up enough for the teams to resume play. With 1:12 left the rain started again, a rainbow appeared over the Colorado tent and the teams managed to finish the game with Cambiaso and Jornayvaz taking control. Pablo MacDonough of Audi and Juan Martin Zubia of Colorado pursue the ball. "We all wanted to finish because the crowd was here," Cambiaso said. "The field was really safe. The problem was at one moment we couldn't see the other end. In the last throw-in I saw lightning off in the distance and said 'look, we have time to play.' So we came out and suddenly the rain slowed down and we played." In the first half, Colorado jumped off to a 3-0 lead early in the second chukker catching Audi off-guard. Audi had trouble with its passing game and had to contend with Colorado's early counter attacks. Juan Martin Zubia of Colorado reaches to hook Pablo MacDonough of Audi. Ganzi got Audi back on track with a penalty two conversion for Audi's first goal, 3-1, with 2:05 left in the second chukker. After Cambiaso missed a goal, Ganzi took the ball from 150 yards out and raced to goal to cut the lead to one, 3-2, to end the chukker. After an exchange of goals by Del Carril off the throw-in and Kampsen after a nice backhand pass from Roldan, Audi trailed 4-3 to start the third chukker before Colorado took control and led 7-3 at the half. 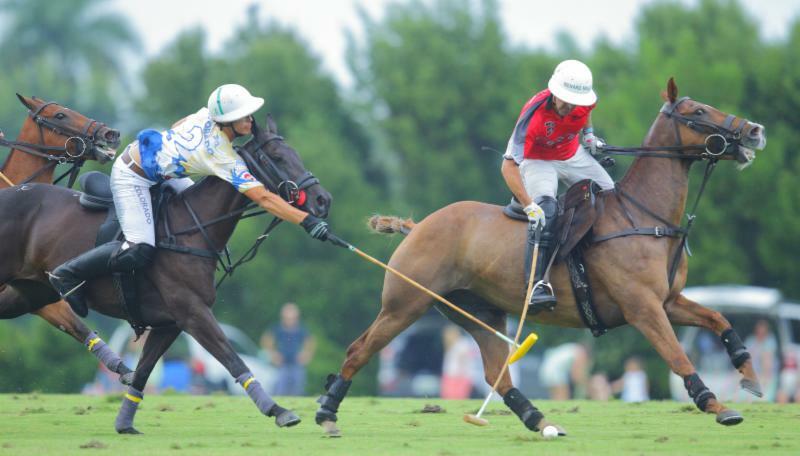 Behind the one-two punch of Zubia and Del Carril, Colorado scored five consecutive goals in the third and fourth chukkers for a 9-3 advantage at the end of the fourth. 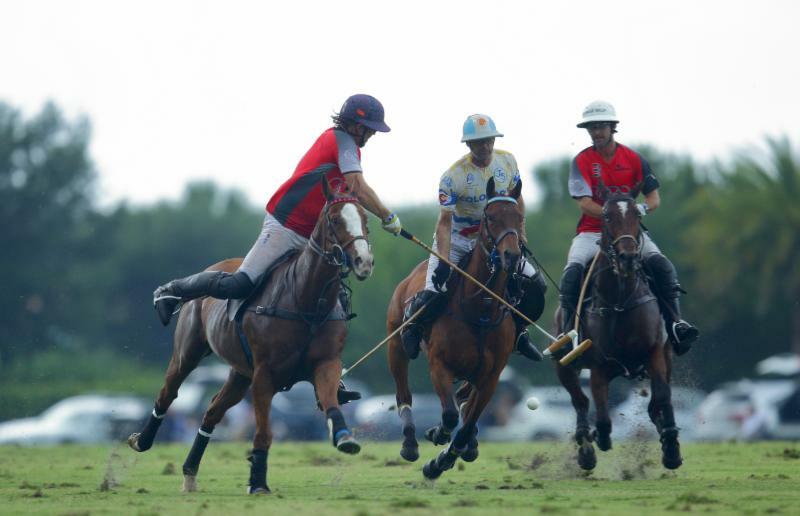 Kris Kampsen of Audi tries to block Colorado's Adolfo Cambiaso's hit ball. Audi staged its big turn around with five consecutive goals after finding its system that got them to the final. Penalties and rain took its toll on Audi's momentum. "They had some bad luck," Jornayvaz said. "They had a couple of opportunities to really seal the deal. They are a fantastic and really strong team and could be walking home with the win, too." For J5 Equestrian, it was the second tournament victory of the WPL season. 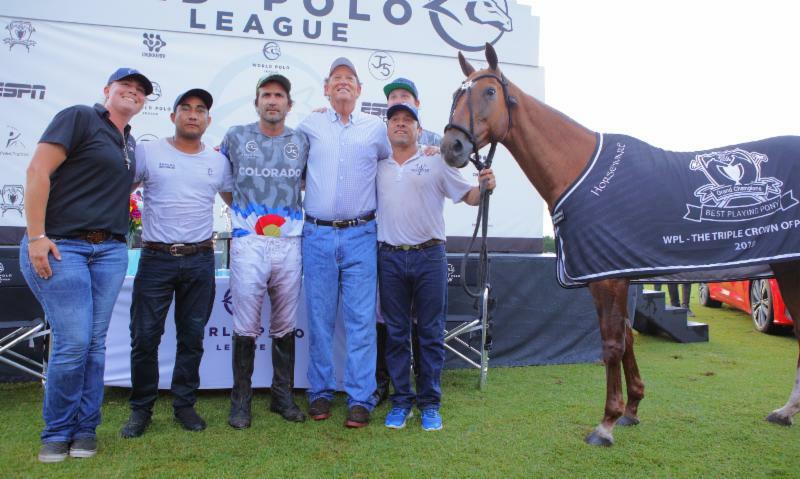 Valiente (Agustin Nero, 6, Santi Torres, 6, Pablo MacDonough, 10, Poroto Cambiaso, 3) earned a 10-9 overtime victory over Colorado (Rob Jornayvaz, 2, Juan Martin Zubia, 7, Rodrigo Andrade, 9, Jero del Carril, 7). 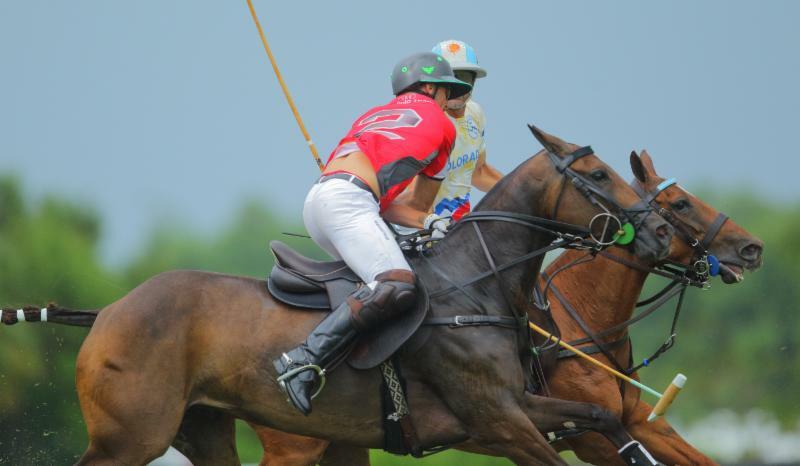 Adolfo Cambiaso of Colorado hits the ball out of the air. "It's been super fun for J5," Jornayvaz said. "It's been a couple years now where Colorado has had its own team. It's been a fun thing for us for J5 to have two teams and so far it's been going pretty well. To end this first season with this win with Colorado it puts us on a similar level to know that both teams are competitive." Zubia and Del Carril each had four goals. Cambiaso added one. MacDonough led Audi with four goals, Ganzi had three and Kampsen added one. American Polo Horse Association Best Playing Pony of the game Rodiseo played by Pablo MacDonough. Rodiseo, played by MacDonough, was named American Polo Horse Association Best Playing Pony of the game. Pizza, also played by MacDonough, was the American Polo Horse Association Best Playing Pony of the tournament. American Polo Horse Association Best Playing Pony of the tournament, Pizza, played by Pablo MacDonough. The American Polo Horse Association was created in 2006 by the legendary Polo Hall of Famer Sunny Hale to recognize polo ponies in America and encourages events that showcase them and hard-working dedication of grooms. Grand Champions Best Playing Pony Gaita, played by Adolfo Cambiaso. Colorado players names will now be inscribed on the trophy and added to an impressive list of teams that feature several top players including Sebastian Merlos, Mike Azzaro, Tommy Biddle, Adam Snow, Nic Roldan, Matias Magrini, Jeff Hall, Mariano Gonzalez, Michel Dorignac and Kris Kampsen. Marc Ganzi of Audi receiving his Catena watch for Best Play of the Day from CEO and President Bill Kraft. 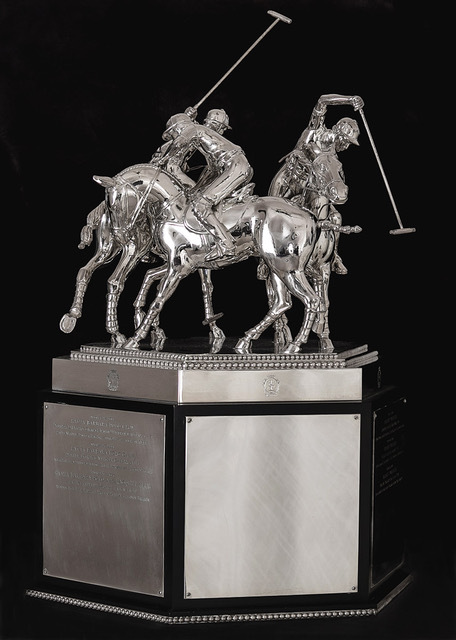 Designed by Tiffany & Co., the coveted Triple Crown of Polo trophy is comprised of three separate trophies that fit perfectly together to create an entire polo scene that is breathtaking in sterling silver. 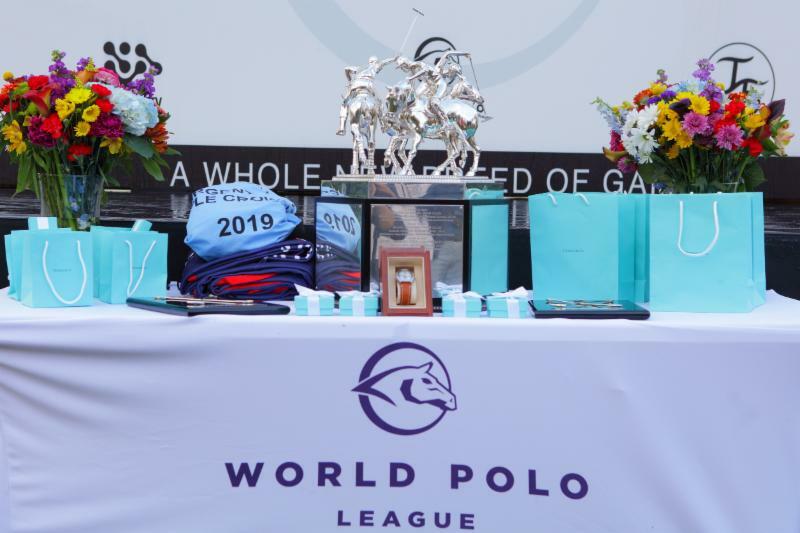 World Polo League awards table for the Triple Crown of Polo final. 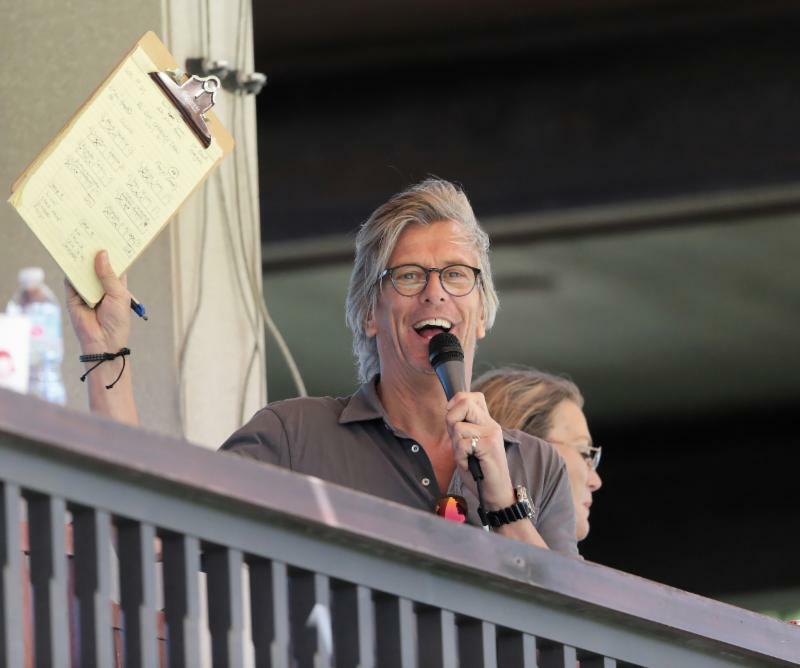 The WPL was live streamed on ESPN Deportes and ChukkerTV/Polo Channel/Horseplay with Gus Whitelaw calling the action. For more information and to watch the games go to www.worldpolo.org for a complete library of WPL first-season games. Co-founded by Grand Champions owners Melissa and Marc Ganzi and Valiente Polo Farm owner Bob Jornayvaz, the successful World Polo League is the only 26-goal polo in the world outside of Argentina. The WPL is preserving the highest level of polo and its rich, hallowed tradition in the U.S. Fans waiting for awards ceremony at rain-soaked Grand Champions Polo Club. The WPL has its own set of simpler fan-friendly rules to improve the flow and action of the game. 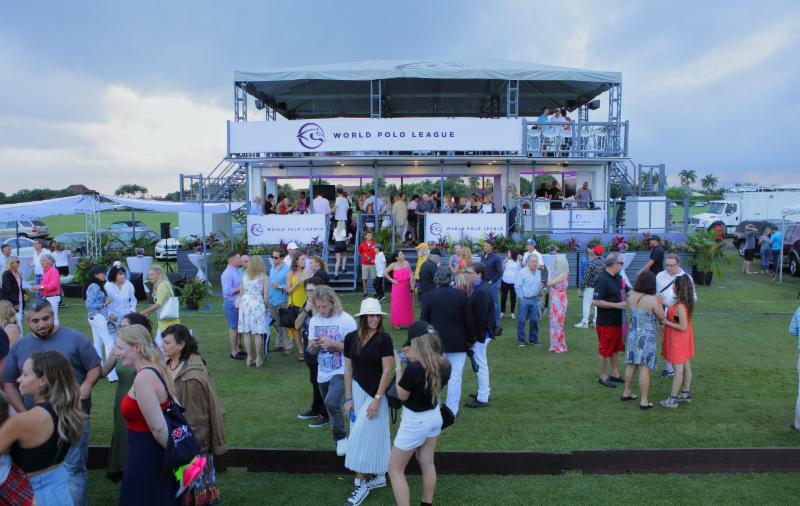 The WPL, with 11 tournament-quality fields to play on, featured the All-Star Challenge Draw Tournament, Founders Cup, Palm Beach Open and Triple Crown of Polo. The WPL is open to teams that wish to compete in one or more of the tournaments. Games are offered on the flat (Open) and on Handicap. 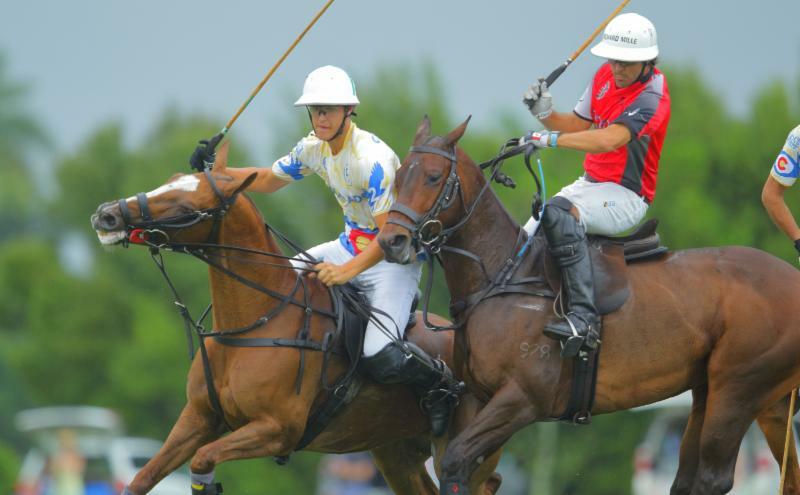 The World Polo League attracted a large international field of players from all corners of the world including Argentina, Australia, Brazil, Canada, Costa Rica, Nigeria, New Zealand, Uruguay and U.S. 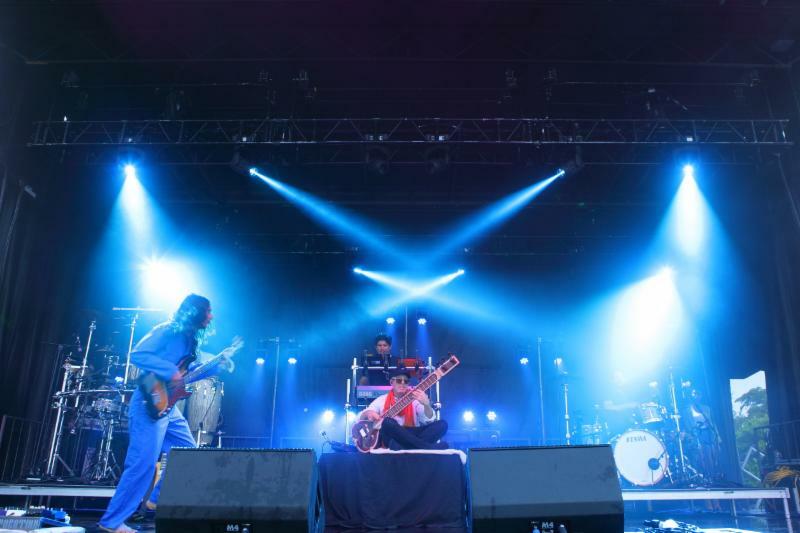 Thievery Corporation, formed in 1995, performed its American electronic music after the game to appreciative fans. 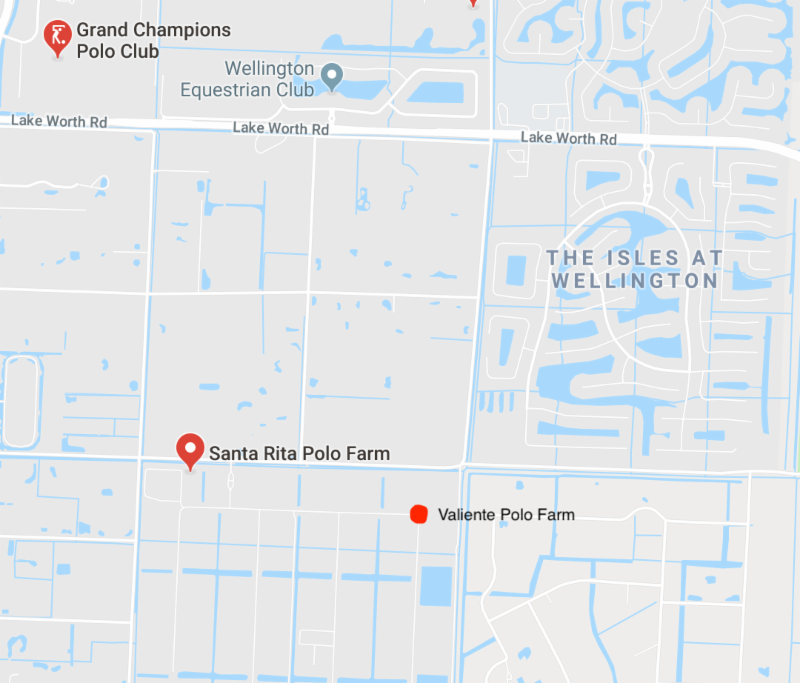 Games at Grand Champions Polo Club, Valiente Polo Farm and other local fields, call our hotline to receive daily game and field information. 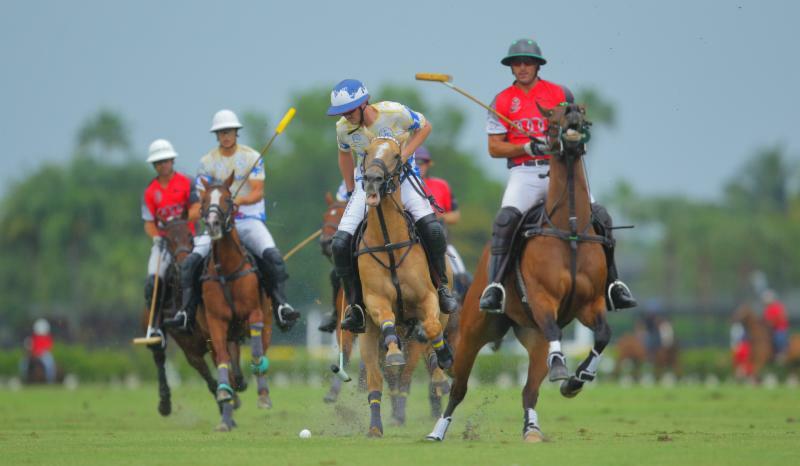 ESPN West Palm (106.3FM) and ESPN Deportes (760AM) signed an exclusive contract with the World Polo League and will target the West Palm Beach, Fort Lauderdale and Miami markets with various broadcasts, commercials and exposure on radio, ESPN.com, ESPN app and social media platforms to promote the exciting new 26-goal league. 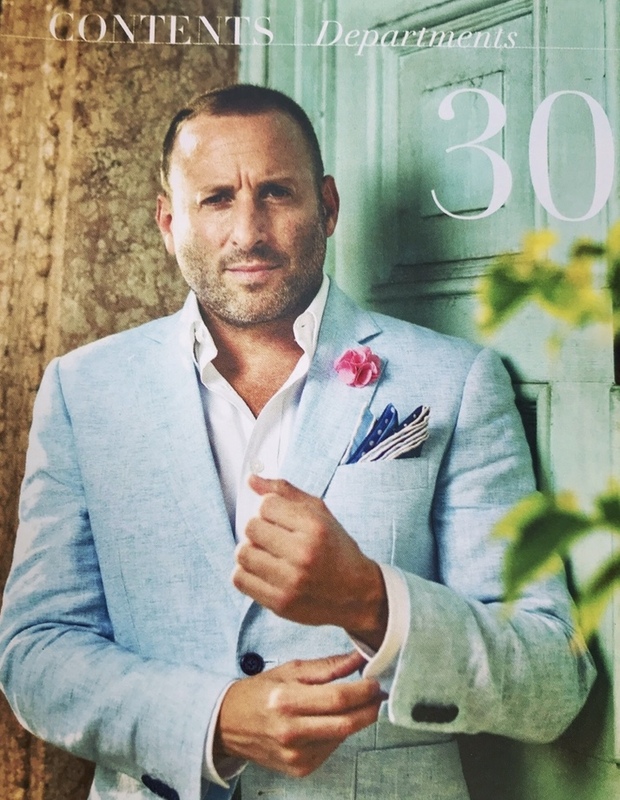 With nearly two decades of sustained success in sports and entertainment broadcasting, Josh Cohen is among the most influential, respected and popular on-air personalities and live event hosts in South Florida. 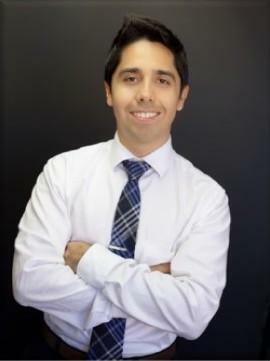 Julian Zaldivar has been a part of ESPN West Palm team and ESPN Deportes760AM manager since its inception. He is the host of Comunidad ESPN Monday through Friday that features all-sports talk and interviews with the Latino community leaders from the local Hispanic market. 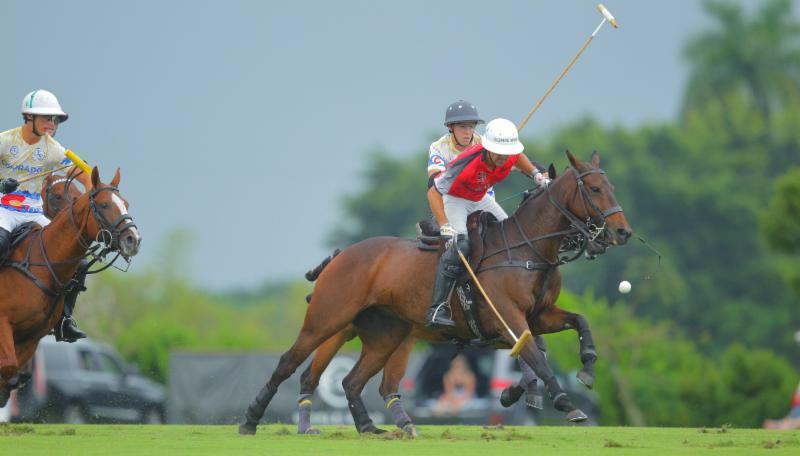 DIRECTOR OF POLO: Juan Olivera, 561-644-5050, juan.olivera@gcpolo.com; hotline 561-644-5050.